It is the largest shopping mall and leisure center in the region of Alicante and offer more than 150 shops and services with brand names like Decathlon, C & A, Primark, Leroy Merlin, Norauto, Auchan as well as Alcampo, the Spanish supermarket giant. This spacious property is located in a quiet residential complex but is within walking distance of shops, restaurants (Chinese, European, Indian, Mexican and Spanish), and bars. The Villa's most outstanding feature has to be its location - the children or the teenagers will never be bored with the pool practically 'on the doorstep'. Noise is never a problem is this residential complex but yet just a few minutes walk will bring you to the hub of the entertainment. The Villa is an ideal Summer Holiday Rental for families with small children and or teenagers. It overlooks the communal swimming pool and is just 10 min walk from the beautiful Cabo Roig Beach and Marina. While the inside of the house is furnished to a very high standard, the outside boasts a spacious patio, a ceramic barbecue and parking space. The upstairs balcony complete with sun loungers is perfect for the sunbather requiring privacy. Local Activities: Waterparks: Aquapolis and Aquapark Quesada. Amusement Parks: Terrica Mitica, a must for children and adults, possibly the largest in Spain situated in Benidorm – please contact us for website address. Bowling: Ozone Centro de Ocio. Go-Carts: Less than 10 mins drive, you cannot miss them beside Champion Supermarket on route to Torrevieja. Horseriding at Campoamor and in the Villamartin area. Scuba Diving at Scuba Tribe and Aquaventura. And for the toddlers: Indiana Bill children’s soft play park. Local Markets: Monday:	San Pedro del Pinatar. Friday: Torrevieja (beside Bus Depot). Saturday: Playa Flamenca (beside Mercadona)- the roast chicken is a must. Sunday: Guadamar - in the fields, a lovely relaxing way to spend Sunday morning. Off peak dates: You can book this villa for mid-week dates (now including July and August) - save, save, save on your flight prices!! I am a School Head and I live and work in Ireland. 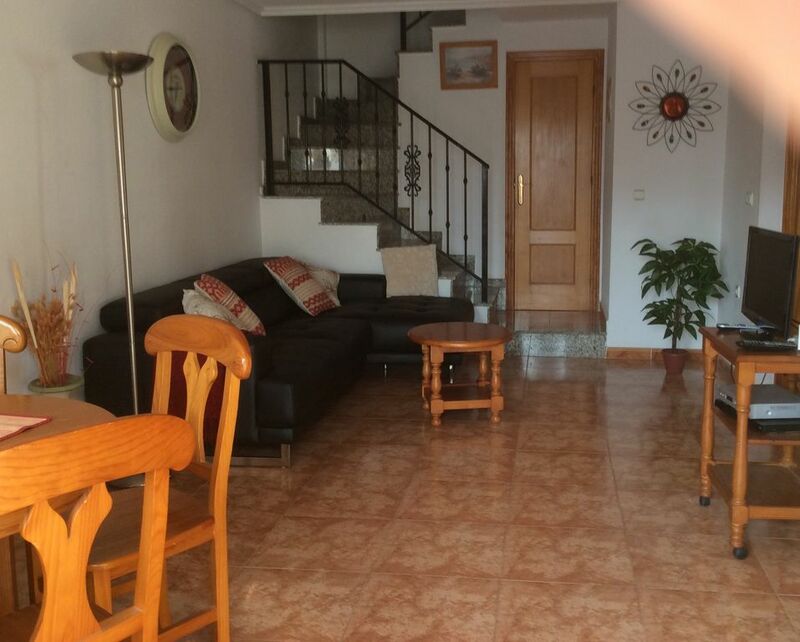 I spend a lot of my school holidays in Spain so this Villa is both a Holiday Rental for you and a precious Holiday Home for my husband and I and my extended family. We have been renting this property now for almost 15 years. For many guests, it is an annual visit as they know the locality and it meets all their expectations. Really, it has the best of both worlds as - it's in a quiet residential location where neighbours respect each other's privacy and children are safe. On the other hand it's just minutes away from bars, restaurants, amusements and all kinds of fun and activities you expect on your holidays. This is an ideal Summer Holiday Rental for a medium/large family. There is a cot and a high chair available and the garden is paved and enclosed making it safe for small children. The playground is situated at the front of the villa complex. The villa itself is very secure with treble lock on the front door and security grills on all windows. Olive's trip to the sun! Left wet cold Ireland on Easter Sunday for a seven day break in the sun. Arrived in Murcia airport and within a half hour was at my destination. We arrived after midnight and access to the property was hassle free. The house was spotless as well as spacious with a large bed room and bathroom downstairs while upstairs had two double bedrooms and bathroom. The upstairs terrace was an ideal chill out area. The sun was just everywhere around the house - from morning until night. My days in the sun were spent walking - and the walks were fantastic. The openness of the walkways and the freshness of the sea was breathtaking. It was my first time in this location but I'll be back. The property is just a short walk from The Strip which has lots of nice restaurants and music bars. Food and drinks were great value for money and there was entertainment every night. A great shopping centre was just also nearby providing me with an opportunity to shop for just about anything you might want. I have just booked a two week stay at the same property for next year. An excellent caretaker made himself available if we need any assistance but his services were unnecessary as everything went to plan for us. The property overlooks the swimming pool which I did not use but was in demand by some children and their parents who were also on holiday. I gave this property a five star rating because, in my opinion, it provided me with safe, clean and very comfortable accommodation for my holiday break as well as being located near beautiful walks, beaches, restaurants and shopping. I am so grateful to have found this little treasure and I highly recommend it to anybody who shares my passion for a break in the sun at an affordable cost. Olive delighted you had such a good stay in Cabo Roig and looking forward to seeing you again soon. A perfect location in the sun! Left wet cold Ireland on Easter Sunday for a seven day break in the sun. Arrived in Murcia airport and within a half hour was at our destination. We arrived after midnight and access to the property was hassle free. The house was spotless as well as spacious with a large bed room and bathroom downstairs while upstairs had two double bedrooms and bathroom. The upstairs terrace was an ideal chill out area. The sun was just everywhere around the house - from morning until night. My days in the sun were spent walking - and the walks were fantastic. The openness of the walkways and the freshness of the sea was breathtaking. It was my first time in this location but I'll be back. The property is just a short walk from The Strip which has lots of nice restaurants and music bars. Food and drinks were great value for money and there was entertainment every night. A great shopping centre was also nearby providing us with an opportunity to shop for just about anything you might want. I have just booked a two week stay at the same property for next year. Brian, the caretaker made himself available if we needed any assistance but his services were unnecessary as everything went to plan for us. The property overlooks the swimming pool which I did not use but was in demand by some children and their parents who were also on holiday. I gave this property a five star rating because, in my opinion, it provided me with safe, clean and very comfortable accommodation for my holiday break as well as being located near beautiful walks, beaches, restaurants and shopping and for real value for money. I am so grateful to have found this little treasure and I highly recommend it to anybody who shares my passion for a break in the sun at an affordable cost. We have recently returned from our stay in Cabo Roig, . the villa is fabulous. Very clean , well equipped and incredibly comfortable . The area is very quiet but yet in walking distance to all amenities. The communal pool looked great, it was a shame that the weather wasn't great to use it. We had a truly wonderful stay and will have no hesitation in returning . Great villa, in a very quiet location, but within 5 minutes to all bars and restaurants, was greeted and guided in on arrival, and was given all the local attractions info, which we greatly appreciated, we were overlooking the communal pool, it was a shame it was too cold to use the pool for the first few days, Villa was comfortable and we were able to heat it on cool evenings. A great stay. Property was lovely, air condition in house to cool us down when back from our days out. Owner of property Mary was very helpful with all Information. Brian the key holder is so lovely, the best anyone could aak for, he was at hand to take us food shopping and assist in anyway needed. We will definitely be visiting again. Hi Keith, sorry to hear you didn't enjoy Cabo Roig. Unfortunately I am waiting for a replacement cover for the Pergola as the wind took it. I'm not sure which beach you visited, Cala Capitan is small but there is a wonderful choice of beaches, obviously more if you have a car. Some are busy some are quiet. La Zenia and Campomoar are both quite big and the beach in Torrevieja stretches all along the town. Again, my apologies about the Pergola cover and hopefully you will return to Cabo Roig again. To see the exact location of the villa, why not visit Google Earth - type the following into the search engine box. Other Activities: 2010 - New Cliff Walk between Cabo Roig and La Zenia Beaches - approx 35 mins brisk walk - in fact this walk is now extended and it is possible to walk all the way to Torrevieja and as far as Campomoar Beach, along the coast. Golf: If it's golf you want, then Cabo Roig is your heaven. Less than 15 minutes drive from the villa, you will find 3 World Class Course - 18 holes of course. Villamartin - This famous Putman designed course opened in 1972. It is a challenging, well established course. Holes 14 (Par 5) and 17 (par 3) . Campoamor -This is a larger course than Villamartin. It has wonderful views of the sea and the hotel on site is the unmissable 19th hole. Las Ramblers (Old River Beds) was designed by Jose Grancedo and opened in 1991. It is a rambling course as the name suggests. World famous La Manga is less than an hour's drive. For more information of Golf in the Costa Blanca, see contact us for the links. Cleaning charge of 70 Euro payable locally on arrival. A refundable breakages deposit of £(GBP) 100.00 is required on payment of balance. Alternatively a £ (GBP) 20.00 non returnable breakage waiver can be paid.